I was a little hesitant to try this. I play rugby for the University of South Carolina and hated the taste of the protein powder that we’ve used. I wasn’t sure if I should switch to ruck science so I was happy to see that they give a sample stack. The amounts are enough to try each product a couple of times to see if you really like it (which I did). Plus, the containers that come with it are very useful. I go from class to practice and then back on campus for meetings so the containers are very useful. 10/10 would recommend if you’re unsure of the product. The stack is a great to figure out what works best for you. It also let’s you sample flavors to decide which is best. Whether I’m traveling for a game, going to practice, or even just going to work, the sample stack gets me through the day. It will hold tea and nuts to get me through work and the supplements I need to power through a lifting session or practice in the evening. When your bag is full of gear, the last thing you need is a bulky container so the compact size of this sample stack is ideal. If you’re looking to test some new supplements or just wanting to try all of the flavors before committing, start here. The most comprehensive sample stack out there! 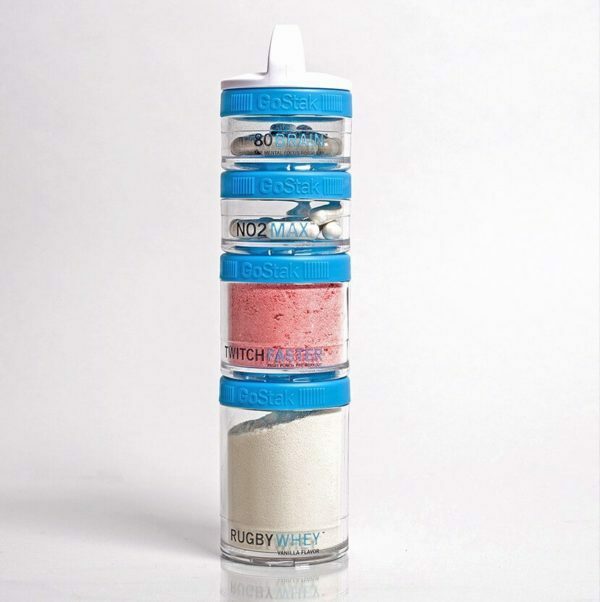 But rest assured, Ruck Science created the perfect sample stack. I was really impressed by the amount of servings that came in the stack. It allows you to actually see how your body performs with each product. You really can’t find a better deal when it comes to cost, flavor, and effectiveness. The sample stack costs less than the combined individual servings alone. On top of that, they throw in a free carrying container to keep your daily supplements organized. The biggest container can hold enough protein for forwards or hair gel for the back line. Cheers Matt – always great to get your feedback. Hope all’s well with the boys in Tucson! Each of the samples was very generous, allowing me to see its effects over time instead of only for a single use. Container is sturdy and holds multiple servings of each product which is nice since I can take only the stack and not everything else for a rugby weekend. Works great! I’m able to put all of my ruck science products in a neat place and keep it in my rugby bag with no mess! This sample stack is great in order to try all of the different products! The stack container itself is super helpful to keep everything organized without taking up too much space in my rugby bag. The individual products were all very good and worked as they are advertised. I will definitely be purchasing the full sizes very soon! The little containers that the products came in were honestly so ideal. It’s so convenient for everyday life. Also getting the sample was super convenient because I know that I wouldn’t have committed to the larger, more expensive versions without knowing if I liked them or not. The pre-workout was incredibly tasty and didn’t leave me feeling tingly or as jittery as other pre-workouts have. The protein powder is really smooth and delicious when blended, too. I’ve never used anything like the supplement pills before but I haven’t experienced any negative side affects.